A series of occasional lectures on important topics in aquaculture, given by visiting scientists and aquaculturists. Artisanal shrimp aquaculture is in a disease-induced crisis of lost production. The immediate cause is biological: rising levels of inbreeding and a strong, positive relationship between inbreeding and disease. The root cause is social: a nexus of human behavior in which breeders protect their intellectual property by generating inbreeding, local hatcheries sell copied, inbred shrimp, and farmers suffer the consequences. Peter Edwards provides an overview of the status of Asian inland aquaculture production systems and technology. 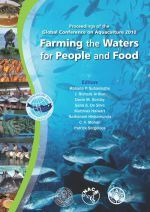 The account characterises the sector, examines major issues, provides historical perspectives on development of the sector and definitions and examples of both traditional and modern aquaculture. This lecture was presented to a visiting delegation of officials from Iraq.